It’s my funny moniker for the ‘okoy’ (shrimp fritters) version I’ve made the other day. Sorry guys, but I wasn’t able to take pictures of my latest magnum opus in the kitchen, so I borrowed from fishoogle. 😀 I was thinking of preparing ‘lumpiang gulay’, but end up with ‘okoy’ as this is a bit easier to prepare than ‘lumpia’. In a bowl, dissolve flour in a little amount of water, add in eggs. Pour the dissolve flour in the mixture of shredded squash, sweet potatoes, malunggay leaves, shrimp and tofu, onion, salt, and pepper. Heat moderate amount of cooking oil in the pan. Put a spoonful of okoy mixture. Fry for about 2 to 3 minutes on each side until golden brown. Drain the excess oil on paper towel and you’re done. Best served with steamy cooked rice. 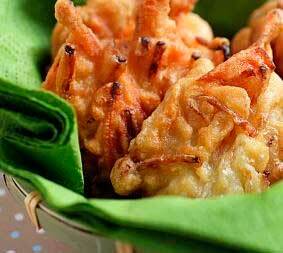 This entry was posted in Favorite Food and tagged fried okoy, fried ukoy, pritong okoy, squash and shrimp fritter on July 2, 2011 by Yami. hmmm….nakakatakam!!! and yes, masarap yan ng maanghang ang sawsawan.